We've been discussing the jewelry box of Queen Mathilde of the Belgians this month, and today we've got a special bonus feature: an in-depth look at one of her most important brooches, the diamond fringe brooch that belonged to the late Queen Fabiola. The floral fringe brooch has been with the Belgian royals since the 1980s, but it has a much longer history. The diamond, silver, and gold brooch dates to the nineteenth-century. According to Ursula's site, the brooch was sold at Christie's in Geneva in 1983. Queen Fabiola began wearing the brooch around the same time, suggesting that it was acquired by her or for her, perhaps by her husband, King Baudouin. Above, she wears the brooch in Brussels in April 1986. Queen Mathilde began wearing the brooch in public a few years before Queen Fabiola's death. Above, the brooch is striking against Mathilde's vibrant blue dress at the princely wedding in Monaco in July 2011. A year later, Mathilde also wore the brooch for another royal wedding -- this time, a family affair. She paired the brooch with her diamond scroll earrings for the wedding of Hereditary Grand Duke Guillaume of Luxembourg, a cousin of King Philippe, in October 2012. Notably, Queen Fabiola (the groom's great-aunt) was also present for this wedding. 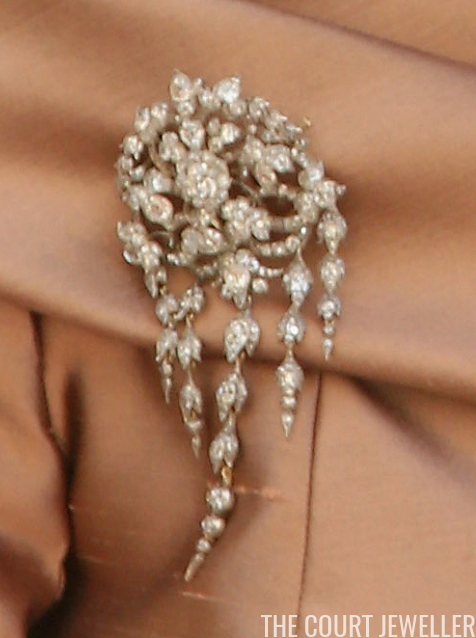 Mathilde has also used the brooch for glittering gala occasions. 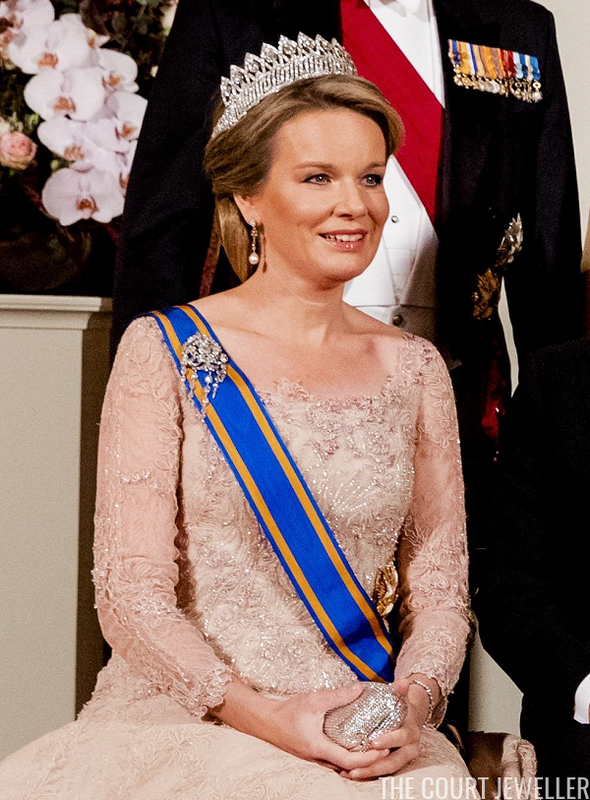 In April 2013, she wore the brooch for the pre-inauguration dinner in the Netherlands, pairing it with her diamond laurel wreath tiara and her diamond fringe earrings. She also wore the brooch with the base of the Nine Provinces Tiara and Queen Fabiola's pearl drop earrings at Prince Carl Philip's wedding in Stockholm in June 2015, as you can see in the photo at the top of the post. In April 2011, she also used the brooch as a hair ornament. The fringes are just visible in her hair in this photograph from the pre-wedding gala in the United Kingdom. After Fabiola's death in 2014, the brooch has retained pride of place in Mathilde's jewelry box. Above, she wears it with the Nine Provinces Tiara and Queen Fabiola's pearl drop earrings during a glittering state visit to the Netherlands in November 2016. The brooch's importance was underscored in July 2013, when Mathilde became the country's first Belgian-born queen consort. For her first official portrait as queen, the brooch was front and center, securing the sash of Belgium's highest order of chivalry, the Order of Leopold.